I guess I was lucky to define my career on the very first day of my very first job. If only it hadn't started with so much sobbing on the floor. I felt so prepared. I had been up since six, putting on my first ever professional outfit and looking over the minute-by-minute schedule on my clipboard. Yes, a clipboard. I can't lie to you. During my first period I was so nervous I hardly even noticed how my students reacted to my well-rehearsed spiel introducing myself, introducing the course, and letting them know what the requirements would be. During the second period I was uncomfortably aware that they did not seem particularly engaged. During the third period my external lecture was accompanied by a simultaneous internal narrative. "What am I doing?! This is going so badly! They hate this! What can I do now? I have nothing else prepared! ...I can't believe I can think one stream of thoughts while saying another!" If I had been in a comic strip, the black cloud above my head would have been reaching epic proportions. By the end of the last class it was clear that I had made the wrong career choice. Not only would I be a terrible failure in my profession but I would have to endure hundreds of days of this kind of agony before I could apply for something else. Nose to nose with the carpet under my desk, I cried until dinnertime. A lifetime of classroom success as a student and now this, my first day on the other side and it was an utter disaster. But then something happened. I ate dinner. I thought about the day. And I made a decision. Lecture was not for me. Never again. So began what was undoubtedly my most amazing year as a teacher. The first year. I spent all my free time designing poetry slam and literature circle units, speed-reading books on portfolio learning and differentiation, baking cookies for graduation speech final exams and Canterbury Tales story pilgrimages, haunting the Los Angeles Public library pedagogy shelves, surfing teaching sites and blogs for inspiration. As the clock ticked on to eleven and twelve each night I was still to be found at the giant "desk system" I got from Ikea, my office light shining out into the California night. 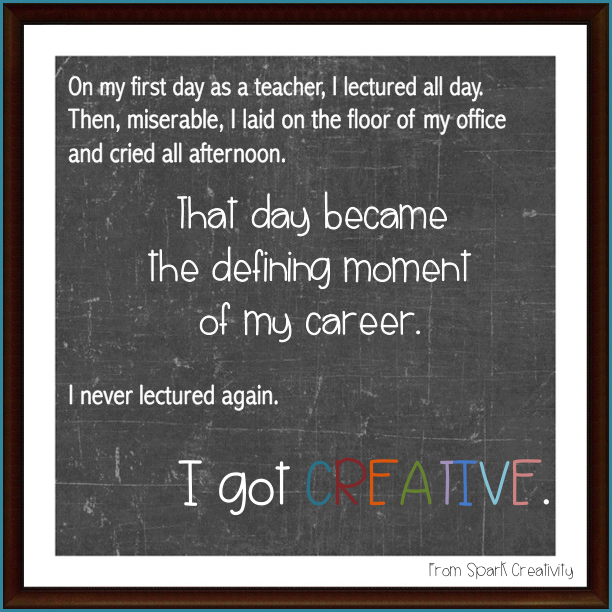 I was exhausted, but I was in love with teaching. The pure creative engagement of it. The joy of unveiling my new plans to my students week after week. On the last day of my first year, my American literature students, the ones who had not made the grades to take Honors or A.P., stood up to applaud for me when I said goodbye. It brings tears to my eyes to remember. It was one of the greatest honors of my life. That year - from the first day to the last - is the reason I do what I do. It's the reason I went on to champion creativity through many years of teaching students, presenting to teachers, and writing for educational publications. It's the reason I now spend my time brainstorming blog posts and designing creative materials for other teachers to share with their students. Though I now spend my days chasing my children around Pennsylvania farm country, I still spend my nights in pursuit of those beautiful creative moments of engagement in the classroom. Except now, those moments are yours. I feel so lucky to be a part of them.